I just heard that Steve Ditko died at age 90. I’m pretty upset. I wrote him letters and was one of the very few people who got a response from him. He brought so much into the original characters that are still famous today like Spider-Man and Doctor Strange. Going way back into the archives of my website, writing about the letters I got from him was how my site got famous. He will be an inspiration to all comic book artists. We will always remember him as an amazing artist who created some really great characters. I think that everyone will miss him. I will miss him in three ways: a friend, a pen pal, and an amazing artist. The story of your original Steve Ditko letter is of course what got me to follow your site in the first place, Carl. It feels only fitting that I return here to remember Steve Ditko with you. I was also sad to discover this news. But I’m happy that he was able to continue doing what he obviously loved until the end: make unique comics. His latest Kickstarter campaign, “Something Big” (presumably featuring Konga), was concluded just days ago. And his long career of 55 years was certainly something big! 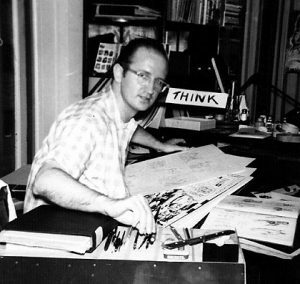 Carl- The news sad that Mr. Ditko was not survived by anyone close. That is so wrong. He is survived by the legacy of all the great characters he helped create and give us the gift of the boom we have today. From Spider-Man to Doctor Strange to one of my personal favorites: The Question. He is survived by them all, and you. You have done so much in his name and your sites success is a testament to that. Never stop doing that Carl and he will never be gone. This was a sad day for us all. Oops – I notice that I have to correct my last comment: Steve Ditko’s career was 65 (!) years long, from the time his first comic was published (1953) to his last (2018). Besides that, I’d like to sign on to what Joe wrote: Don’t stop doing what you’re doing, Carl! It’s kids like you who keep comics, and not least the work of the “old masters” like Steve Ditko, alive!